2 Bedroom Detached House For Sale in Buxton for Asking Price £475,000. UNDER OFFER - Set in approx. 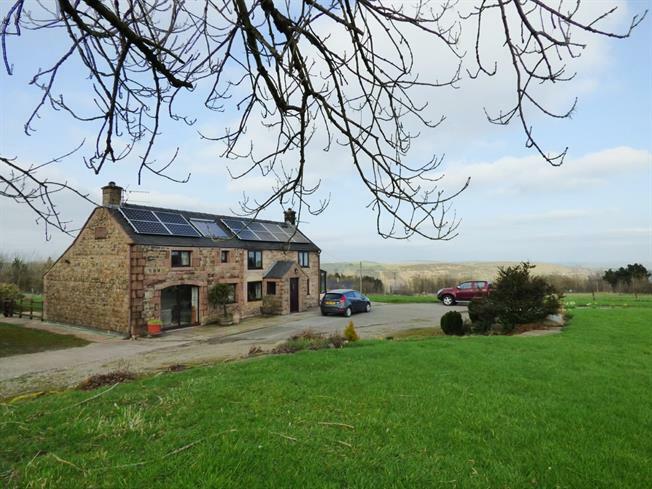 8 hectares and with the property itself set in spacious and well tended grounds this delightful smallholding is sure to appeal to a wide variety of buyers. An entrance porch opens to a spacious entrance hall, a large L-shaped living/dining room with adjacent study, a snug/optional third bedroom, a fitted kitchen, a conservatory and a large laundry/boot room with cloaks/wc to the ground floor, whilst to the first floor a landing leads to two double bedrooms and a bathroom. Viewing is highly recommended. Double glazed windows facing the rear, a double radiator, a vaulted ceiling with exposed ceiling beams, spotlights and wall lights. Double glazed window facing the rear, a radiator and a storage cupboard. Double glazed double doors opening onto the rear patio, double glazed windows to the rear and sides, a polycarbonate roof, a wall mounted living flame effect convection fire, tiled flooring and exposed stone walls. Double glazed windows facing the front and side, a fireplace with inset living flame effect gas fire, a double radiator, exposed ceiling beams and wall lights. Bespoke wall and base units, granite work surfaces with ingrained drainer and an inset stainless steel sink and with mixer tap, space for a range oven with over hob extractor and space for a dishwasher. Double glazed window facing the rear, a double radiator, tiled flooring and tiled splashbacks. Bespoke wall and base units, roll top work surfaces, a belfast style sink with mixer tap, space for appliances including a washing machine, a dryer and a fridge/freezer. A hardwood door with double glazed pane to the side opening on to the patio, double glazed windows facing the rear and side, tiled flooring and a floor mounted boiler. Comprising of a close coupled WC, a wall-mounted wash hand basin with tiled splashback, a double glazed window with frosted glass facing the side, a double radiator, tiled flooring and an extractor fan. Double glazed windows facing the front and side and two double radiators. Double glazed window facing the front, a double radiator, exposed ceiling beams and wall lights. Comprising a panelled bath with mixer tap, a pedestal wash hand basin and a close coupled WC. Double glazed window facing the front, a double radiator/heated towel rail and tiled walls.